While we were still in the Bahamas, were ‘discussing’ our route to Jamaica. We had wanted to visit Cuba but our insurance carrier specifically excluded coverage for Cuba, Venezuela and Honduras. 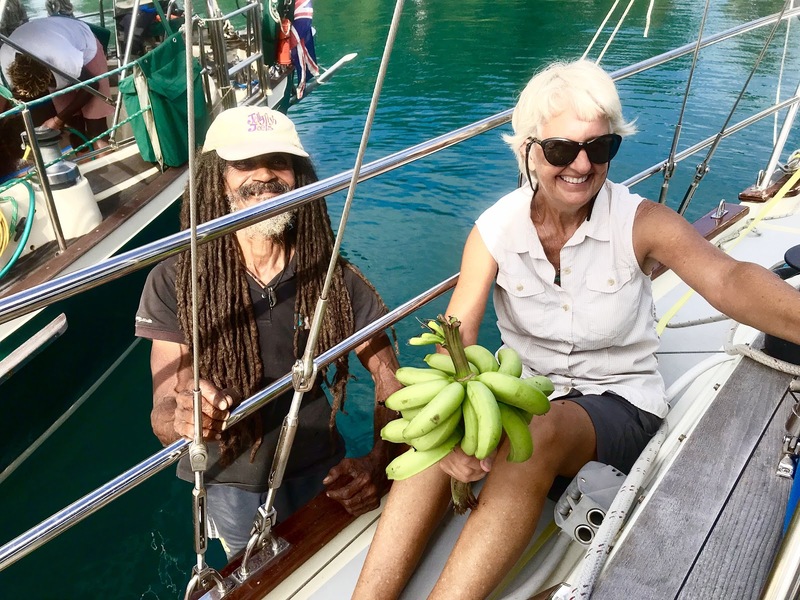 There was no argument about whether to transit the Windward Passage but there was ‘discussion’ on whether we should head for Kingston (on the south side of Jamaica) or to Port Antonio on the north shore. The main advantage, in my point of view, was that Kingston offered a better angle at which to cross the western Caribbean – if we were on the north side, we wouldn’t be able to turn south until we reached the western end of the island, which is about 78°West. This would mean a close reach all the way to Panama with beam seas. The other side of the ‘discussion’ was that Kingston was notoriously dangerous for tourists. In the end, it was ‘decided’ that we’d make landfall at Port Antonio. On board for this passage was our good friend, Christie, whom we met when Ruthie was in university. 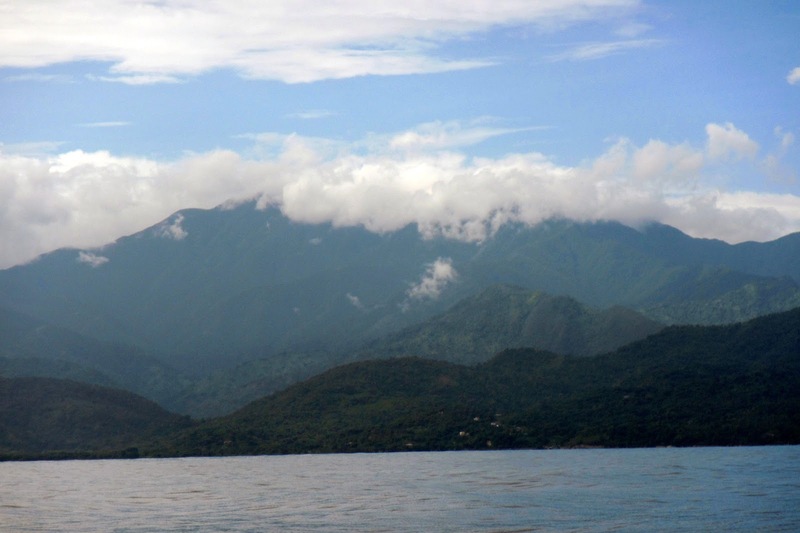 Though the Windward Passage is well known for squeezing the trade winds between Cuba and Haiti, our passage through there was so light that we had to motor most of the way. Arriving at dawn, we steered into the well-protected harbor of Port Antonio, past the rarely-used cruise ship terminal and into the small but nice Errol Flynn Marina, where the eager-to-please staff helped tie us up to the non-floating concrete docks. 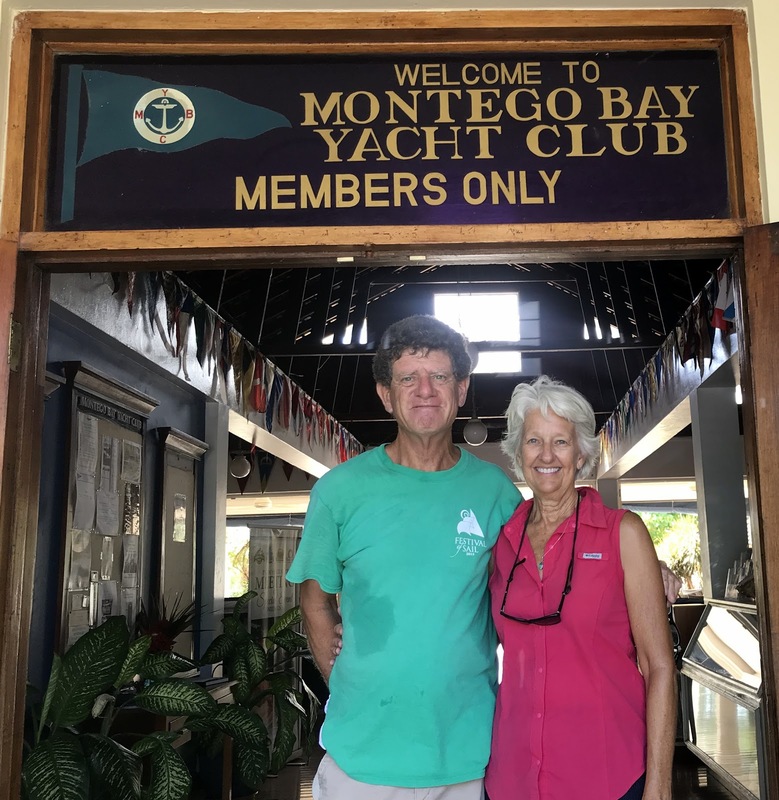 Once the marina office was open, we checked in with them and they made arrangements for Customs and Immigration to come to the boat. A man on the dock sold us a Jamaican courtesy flag. The other yachts at the marina were flying country flags from all over the world, a part of cruising that we had missed while in the US and the Bahamas. The hills surrounding the harbor were dark green with thick tropical jungle and the sounds of construction, crowing roosters, squealing school girls and traffic created a constant din. 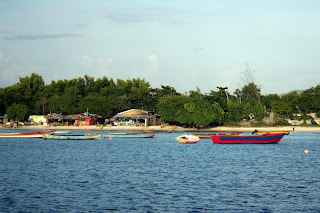 We were approached by Famous Man, an elderly man who poled a lashed-together bamboo raft around the marina, taking orders for fresh fruit and fish. We ordered bananas. Famous Man had dreadlocks down to his waist and very few teeth. Once Customs and Immigration had cleared us in, we took the short walk into the center of town and followed our traditional routine that we almost always follow when arriving at a new country: First, find an ATM that looks relatively safe, second, buy a local SIM for our mobile phones and third, find a grocery store. The ATM is usually not too difficult but buying a SIM can often be confusing. The line at the DigiCell store was long and once we made it to the counter, we made few friends in the line behind us as it seemed to take a very long time before we had completed our transaction. The center of town could have been in any country with a developing economy – few modern buildings and many buildings were in need of repair. As we walked through the streets, we kind of stuck out among the crowd. Instead of the laid-back atmosphere we often found in many part of the Caribbean, here it seemed like most people were focused on their tasks. Still, everyone was very friendly and many people approached us, trying to sell us various things. Christie bought a couple of home-ripped CDs. I had several people stop me and look me right in the eye, their heads cocked a little to one side and say, “Are you finding EVERYTHING you’re looking for?”. I didn’t bother explaining that I come from California, where the ganja is legal and very strong. Besides, we keep zero cannabis on the boat – it’s too much of a liability in some countries. Our Lonely Planet guide book for Jamaica said that the very best jerk chicken in all of Jamaica was in Port Antonio and we were able to find the place without trouble. It was a small, v-shaped building with a small window at which to place an order. Through this window you could see out behind the building where a large, home-made barbecue was belching smoke and an old, heavily-perspiring man was tending the meats cooking. 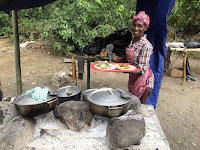 The smell kicked our salivary glands into high gear and the chicken was so good that we ordered from this place every day we were in Port Antonio. 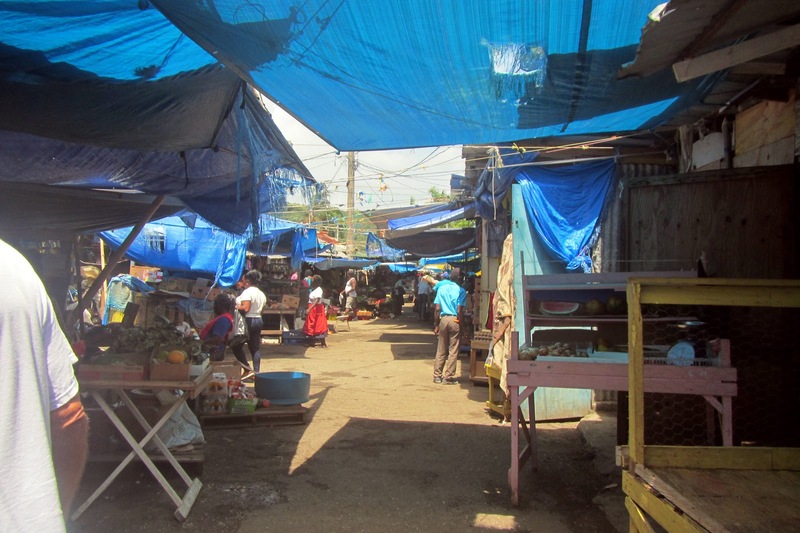 The open air market had a fabulous collection of fruits, vegetables, eggs, spices and other odds and ends. Again, everyone one was very friendly to us, frequently offering us samples and willingly smiling when we asked for a photo. 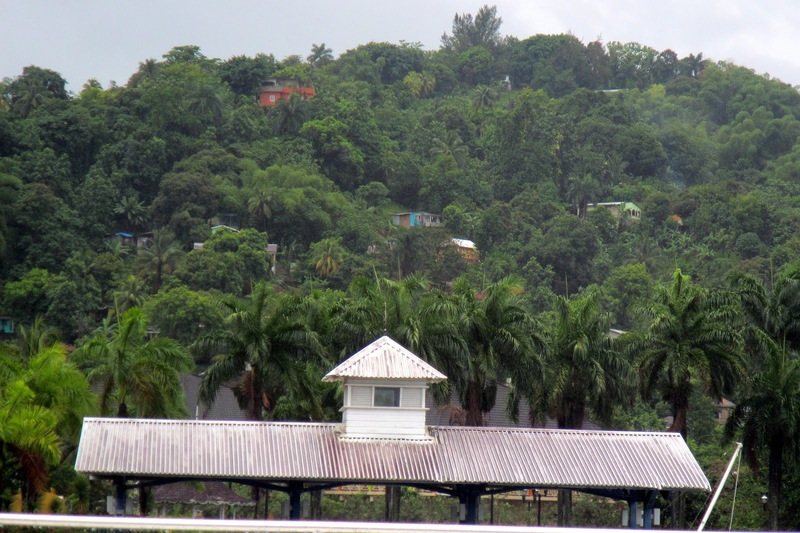 The marina office arranged a car and driver to take us to Ochos Rios, a wide, shallow river that flows through Jamaica. 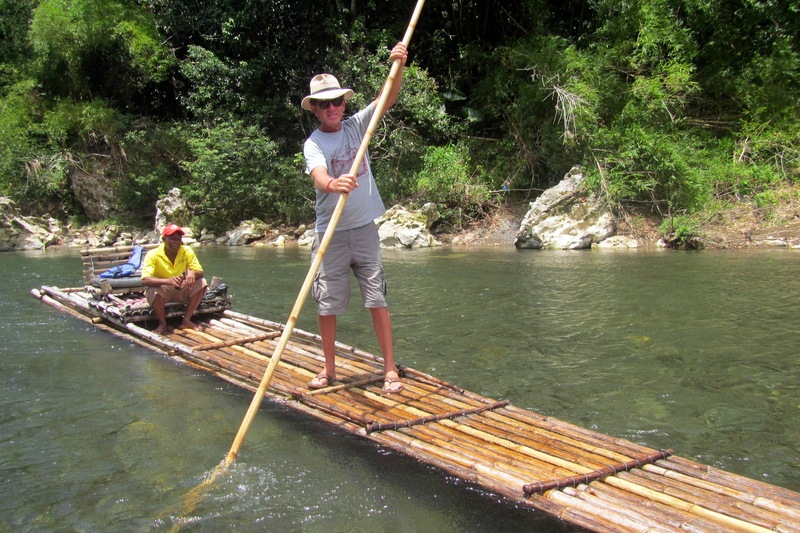 Guides pole lashed-together bamboo rafts through the jungle while the tourists sit back. 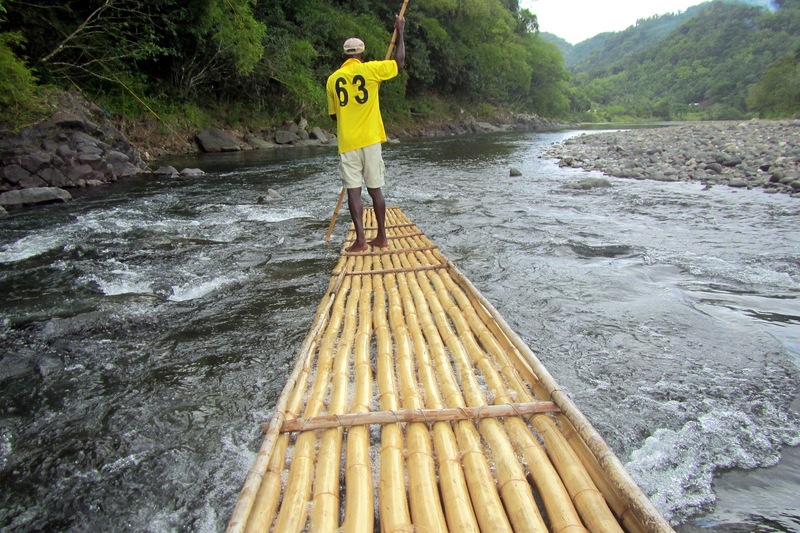 However, after a while, I asked the guide poling our raft if we could change places. So, he sat back while I tried to pole us along and I quickly found out that it wasn’t as easy as it looked. After running us aground, my guide took over. We stopped for lunch at a planned spot and had a surprisingly good meal of curried goat and vegetables that was heated over small wood fires, the outsides of the pots thick with black soot that had accumulated over the years. In order to leave Port Antonio, we still had to clear out with Customs and Immigration, even though we were going to another port in Jamaica. We had an easy sail over to Discovery Bay (we had cleared out to Montego Bay but stopped for the night in Discovery Bay) and I was a little disappointed that the bay was as rolly as it was. The loud music blasting from one of the shore-side cantinas didn’t help me appreciate the bay any more. But we only stayed one night and the next day we sailed into Montego Bay. Montego Bay Yacht Club has two docks for Med-mooring but it seemed expensive and a little dodgy at best. Besides, with Rutea’s davits hanging over the stern, Med-mooring loses a lot of its appeal. We anchored just off the yacht club but very close to the cruise ship terminal, which was busy with traffic of the behemoth ships. The yacht club charged us a fee for anchoring. The following morning we were up early to talk with Chris Parker about our passage to Panama. Chris Parker runs a weather forecasting service out of Florida for yachts on the East Coast of the US and the Caribbean. He broadcasts his forecasts on single side-band frequencies and, if you subscribe to his service, you can ask questions of him. We have been listening to Chris Parker for years and his patience amazes me. Time and again I have heard boaters call into him and ask for a specific forecast for which he had just described to the previous caller in great detail. But, Chris, without skipping a beat or his voice betraying any frustration with repeating the same lengthy forecast, goes into the same detail all over again. He is thorough – almost to a fault. I waited for an opportunity for the radio traffic to clear so I could ask Chris about our passage to Panama. We had a good, clear signal and I could hear him thinking. He paused and then said, “I don’t want to freak you out . . .”. As long as we’ve been listening to Chris Parker, we had never heard him say those words together. He went through his forecast for us and ended it by saying, “If I were you, I’d leave sooner rather than later.” It took Ruthie and me about two seconds to decide that we would leave the following day. Our friend, Christie, had a flight booked for two days later so she had to scramble to find a hotel for one night. 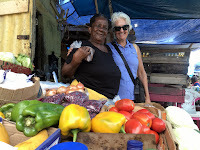 Ruthie and I began going through our off-shore check list, checking out with Jamaican Customs and Immigration, a quick final provisioning and preparing a first-night-out meal. We left the following morning, amidst numerous squalls full of thunder and lightning. Once clear of South Negril Point, the wind filled in from the southeast and the seas built to about 3 meters. We settled in for the 500+ mile passage.